July 6 – The Asian Football Confederation (AFC) brought its top leagues together earlier this week for a forum that put financial stability at the top of the agenda. 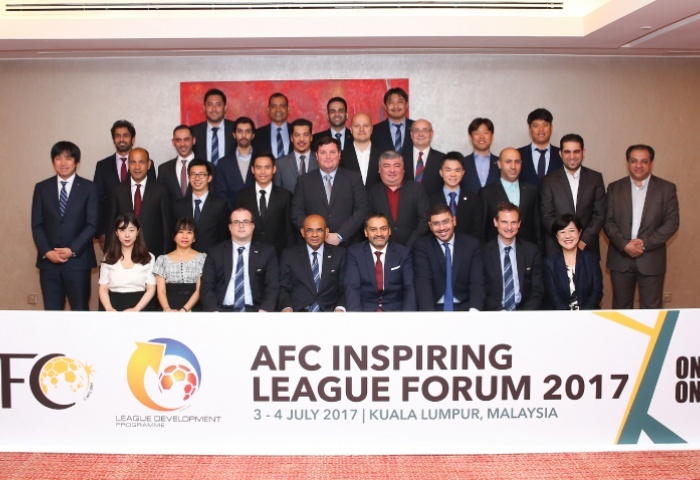 The meeting was organised as part of the AFC League Development Programme. “To deliver the best development plans, the best players and top coaches, the financial future of our leagues and clubs must be secure,” said AFC General Secretary Dato’ Windsor John at the opening. Leagues present were given an overview of the current financial pattern of team competing in the AFC Champions League that shows a pattern of expenditure rising faster than revenue increases – a cycle the AFC is keen to break. Participants were given insight into the cost control measures in place in Europe by UEFA’s Head of Asia-Europe Affairs, Alex Phillips. Leagues and federations also shared overviews of their own financial models. It was a sentiment agreed across the board with the AFC leading an in-depth discussion on the need to implement more unified cost control mechanisms and frameworks across the confederation. One of the key challenges in Asia is the difference in commercial development between leagues and nations, and hence the need to regulate according to their needs. Leagues present included Australia’s A-League, Chinese Super League, Hong Kong Premier League, Islamic Republic of Iran’s Pro League, Iraqi Premier League, Japan’s J-League, K League in Korea Republic, Qatar Stars League, Saudi Professional League, Thai League 1, the UAE League and the Uzbekistan Professional League.